Ever Hear of a Ghost Tree? 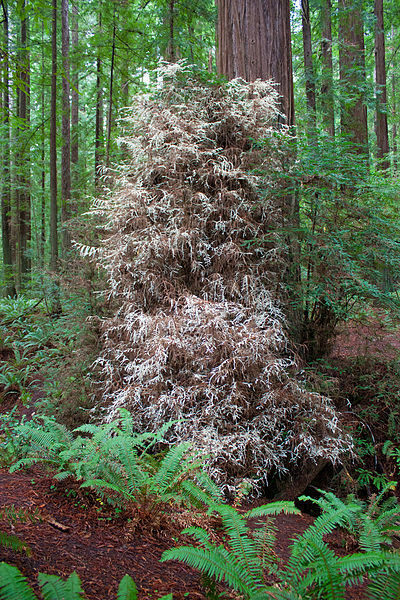 That tree and those like it are called “albino redwoods” — a misnomer of sorts, because “albino” refers to a lack of melanin (not chlorophyll) — but one gets the idea. There are about 25 known to exist, per NPR, and other reports say there are as many as 50-60 in the wild, with about eight in Humboldt itself. Due to the rarity, they are hard to study — but not impossible. For example, while we don’t know how the genetic mutation happens, but how these trees survive is well understood. They steal resources from other trees. If you want to see one in person — well, that’s tricky. They are so rare that officials at Humboldt restrict access to the tree above, of course. But they go one step further. In order to protect it from human interference, officials don not even publish details of its location, according to this report from TV station KQED.